We are very happy to announce that three UICB MFA candidates, Candida Pagan, Radha Pandey and Matt Runkle, have received awards for current book projects from the Caxton Club, an organization located in Chicago, “devoted to the literary study and promotion of the arts pertaining to the production of books”. These grants of up to $2500.00 are awarded to graduate students for a range of projects devoted to the book arts and study of the book. All the proposed projects are part of or related to current thesis work. Matt Runkle is working on an artist book entitled Catholics. The book's core consists of memoir fragments that explore Church history, pre-Christian mythology, and the places where such spiritualities overlap and conflict with seemingly profane elements of contemporary culture. The work, a printed edition of twenty-five, will include digitally printed illustrations and Bruce Rogers-inspired images built out of typographic ornaments. The prose sections will be letterpress printed from metal type. The book will be released in Spring 2015. Candida Pagan’s project entitled "The Eccentricity is Zero", is a set of eight broadsides made in collaboration with poet Lauren Haldeman. Haldeman is writing poems in response to prompts she receives as Candida conducts bibliographic research into medieval and early modern scientific theories. The poems will be hand set in metal type and imagery will be created collaboratively by Pagan and Haldeman. The broadsides will be printed on UICB Chancery paper. "The Eccentricity is Zero" is one portion of Pagan's thesis work, which considers early scientific and cosmological development and its relationship to contemporary knowledge. The prints will be housed together in an edition of 25 to be released in Spring 2015. 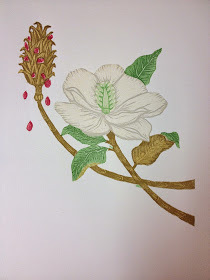 Radha Pandey’s piece entitled Anatomia Botanica: Botanical Anatomies of the Sacred Lotus, Red Hibiscus and Southern Magnolia, describes and illustrates the three flowering plants. Through the text and imagery, Pandey reflects on and reveals her own and society’s relationship to the natural world. The design and illustration takes inspiration from Mughal Indian and Western European medieval styles and aesthetics. The text is printed from hand set metal types and the images have been created using reduction linoleum cuts, and pochoir. Anatomia Botanica will be released in November 2015 at the Pyramid Atlantic Book Fair in Silver Spring, MD.